It’s time to go beyond the run-of-the-mill cakes. Step up your game with customised cakes by Deepti Dawson, which are a treat to both your eyes and your taste buds. 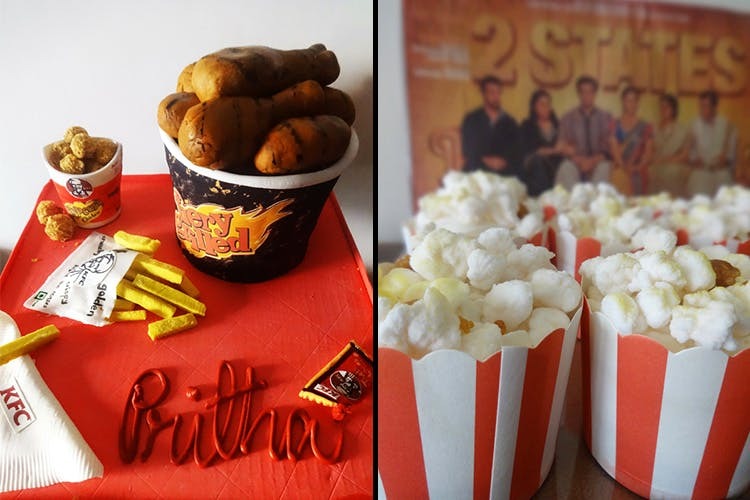 A self-taught baker with six years of baking experience, Deepti Dawson stands atop the cake game with customisations from dinosaurs to Minions, burgers to roast chicken, princesses to superheroes, and T-shirts to sneakers in her arsenal. Be it a birthday party, an anniversary, a baby shower, or even a wedding, you can get your creative juices flowing and order in a crazy cake for the special occasion. When it comes to flavours, you can either mellow out with a traditional Chocolate, Vanilla, or Red Velvet or throw your palate for a spin with Strawberry Compote, Peanut Butter, Coffee or anything else you can think of. This cake maestro also does personalised cupcakes and cookies, and honestly, now you don’t really need an occasion to delve into this sugary heaven. The cakes start at INR 1,500 per kilo with a minimum two kilo order to be placed. The final price will vary depending on the design, complexity, and the number of toppers. You’ll have to place the order with a minimum one week’s notice. People even go as far as a month in advance! Deepti is based in South Delhi, near Siri Fort and you’ll need to pick up your order on your own. We're not really complaining, though–her cakes more than make up for the effort. For clients that want to preserve a memory for longer than an edible topper would allow, Deepti also makes customised figurines in clay. She needs to be given two-three weeks’ notice for this. To contact Deepti and order, you can drop her a line at ToBakeBelieve@gmail.com.